Home > World News > Should Lochte be Locked Up? Should Lochte be Locked Up? Didn’t your mother always tell you not to lie? 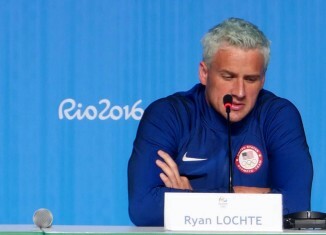 Maybe Ryan Lochte’s mother didn’t tell him often enough. US Olympic swimmer got caught in a lie while in Rio during the 2016 Summer Olympics and is now facing a trial to determine his punishment. It’s said that he could either go to jail for one to six months or just be given a fine by the judge. What really happened? In the early morning of August 14th, 2016, Lochte and three other swimmers were intoxicated at a Rio gas station. Ryan Lochte told reporters that he and his friends were held at gunpoint and robbed of their money. However, later on, the truth came out. The three other swimmers, Gunnar Bentz, Jack Conger, and James Feigen, told their versions of the story, versions that matched up with the footage from surveillance videos which showed the four men vandalizing the gas station and knocking over items among other things. To stop the men from leaving the station, a security guard had to draw his gun on them and take their money to pay for the broken items. his entire life. His twelve Olympic medals can vouch for his hard work. Lochte is now 32 years old. Twenty-seven years of swimming perfection down the drain because of one lie. Should Lochte have told the truth and taken his consequence? Or was the lie and bigger consequence worth his career? Only time will tell how Ryan Lochte recovers from this setback.